Loom, being Jerome Froese, Johannes Schmoelling and Robert Waters are currently working on a second Loom album. On their website they unvealed a little secret about the forthcoming , being a collaboration with Irish singer and harpist Moya Brennan. I´m very curious how this combination might sound. Looking forward to this future release. 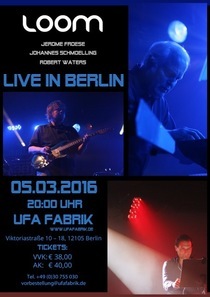 Loom will be performing live on stage at the ufaFabrik Internationales Kulturcentrum on March 5th, 2016.
or check the Ticket Office. The LOOM concert in Berlin is now officially SOLD OUT!